Mother’s Day is the day we honor the women who were delivered by children — the women who love us more than they love themselves, whether they are our actual mothers and grandmothers, or the sisters and mentors who have come into our lives and taught us what love means. 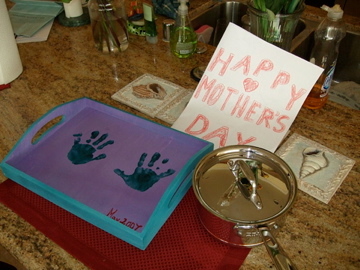 Today, I not only think of my beloved mother, who smiles down on me as I love her grandchildren and laughs at me each time I use the klunky electric skillet I always teased her about. But I am also made complete with gratitude toward my children — the people who gave birth to the mother in me. I would not be me without them. This one is for the babies. In my heart you will remain forever young . . . Thank you. I’m in one of those ” Place for Mom—and You Can Drop Off Pop” setups, and saw a lot of happy moms today–plus a few sad ones. It’s 7 years later, and I still miss trying to do something special for my under-appreciated wife. It’s interesting how it’s the opportunity to give that we miss even more than the opportunity to receive. All the best to you. You definitely hit the nail on the head with this one, Piper. I vividly remember the day almost 47 years ago when a doctor told me I had a little girl. My life hasn’t been the same since.